That is a mighty mustache, Mr. Fučík. In 1897, Fučík wrote Entrance of the Gladiators while working in the Czech army as bandleader for the 86th Infantry Regiment in Sarajevo. In 1907, he wrote another popular march, the Florentiner March. While that piece of music never reached the memetic fame of Entrance of the Gladiators, it is a popular repertory piece for military bands today. Unfortunately, World War I eventually arrived and ruined everything. Fučík’s business and health failed in wartime. He died of cancer in 1916 in Berlin, Germany, aged 44. He is buried at Vyesehradsky Hrbitov in Prague. Louis-Philippe Laurendeau was a Canadian composer, bandmaster, writer, and music publisher. 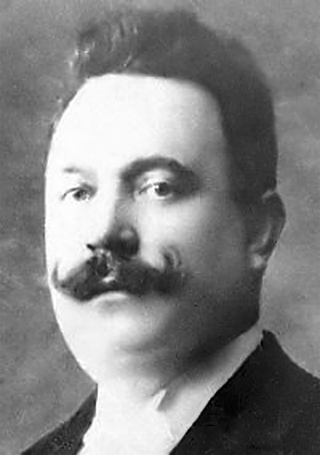 Born in 1861 in Quebec, Laurendeau died in the same year as Fučík: 1916. 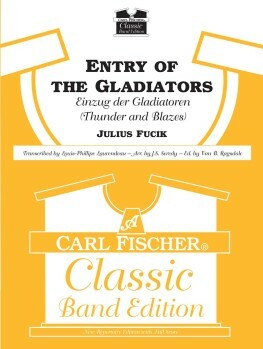 Laurendeau made the smaller-band arrangement of Fučík’s Entrance of the Gladiators in 1910, publishing it as “Thunder and Blazes” under Carl Fischer. In the original publication, the piece is credited to “Fučík-Laurendeau”. Generally, the march is divided into three parts. The first part contains the melody that the trumpet keeps and the several supporting parts. The second third is the section where the low brass (mainly the tubas) take over with the chromatic scale like role. Finally there is a trio, or a slow melodic section, where there is a strong balance between woodwinds and low brass. The trio has a part similar to the second third with a chromatic scale like sound. The piece is written in cut time and is originally written to be played at standard march tempo; however, when played as a screamer it is usually played much faster. Okay, time for a translation for the people who aren’t already music nerds. A chromatic scale is a musical scale with twelve pitches, each one semitone above/below one another. Modern Western music is mostly written with notes set on a chromatic scale, with each note equidistant from its neighbor in terms of tone. (This wasn’t always the case. If you want to really fall down the rabbit hole of the internet, start looking into arguments about things like Pythagorean tuning and just intonation.) In other words, if you look at a modern piano, the white and black keys all fall on a chromatic scale. If you start play one piano key and then play the next 11 keys above that, you will arrive at the same note, except one octave higher than your starting point. In Entry of the Gladiators, you can hear the woodwinds and horns swoop up and down all the notes on the chromatic scale. An example of a 3/4 time signature. A time signature tells a musician two things: how many beats there are in a measure, and what sort of note represents one beat. In the image of a 3/4 time signature above, there are three beats in each measure, and a quarter note represents one beat. The three notes you see above, with the stems and filled dots, are quarter notes, so you see one full measure represented. In a full piece of music, multiple measures are strung together to form musical patterns and melodies. Back to cut time. A time signature of 2/2 says that there are two beats per measure (top number), and that a half note (stem with an open circle) is one beat. Cut time is also known as alla breve, and is often found in marches. Tempo is the speed at which each beat is played. “March tempo” is 120 beats per minute, a simple 2 beats per second. But the Wikipedia bit says that Entry of the Gladiators is played faster when it’s played as a “screamer march”, so what is this “screamer march” thing? A screamer march is a particular breed of march, one of those exciting, upbeat, barn burner marches favored at circuses. A screamer march is often faster than a normal march, played at 130 to 150 beats per minute. Many screamer marches have overlapping melodies. Due to the speed and complexity of the music, screamer marches are often challenging to play, particularly for brass instruments. Screamer marches tend to stay at one volume. The Wikipedia article contains a long list of other interesting screamer marches, in case you want to be whipped into a frenzy of excitement. Circuses originated in ancient Roman times. Originally, a circus was a building, made for the purpose of exhibitions: horse shows, battle re-enactments, and whatnot. Think of the chariot race in Ben-Hur: that oval track is a Roman circus. The word “circus” came to mean a performance instead of a building during the 18th century. It was at this time competing equestrian shows were touring around Europe. In 1872, Charles Didbin and Charles Hughes, opened a show named Royal Circus on November 4, 1782 in Lambeth, London, England. The show was meant to compete with Philip Astley‘s Amphitheater of Equestrian Arts, which was just a short distance away. Astley’s show, which involved jugglers and clowns as well as horses, established the structure of the modern circus, but Didbin is the person who actually gave the term ‘circus’ its modern meaning. The circus was again revolutionized in the United States when a man named P. T. Barnum came along. 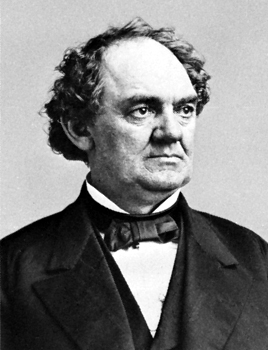 Barnum was 61 years old when he established “P. T. Barnum’s Grand Traveling Museum, Menagerie, Caravan & Hippodrome” in Delavan, Wisconsin in 1871 with partner William Cameron Coup. In addition to the usual clowns, jugglers, and animals, Barnum’s circus invented the “three ring circus” setup, as well as the inclusion of a “freak show”. In 1881, Barnum’s show merged with James Bailey and James Hutchinson to form “P.T. Barnum’s Greatest Show On Earth, And The Great London Circus, Sanger’s Royal British Menagerie and The Grand International Allied Shows United”. Thankfully, this was later shortened to “Barnum & Bailey”. It was under Barnum’s watch that circuses became a cultural phenomenon in North America. Barnum was one of the shrewdest marketers in all of history, becoming known as the Shakespeare of Advertising. Barnum & Bailey weren’t without competitors, though. The Ringling Brothers Circus was founded in 1884 by five brothers in Baraboo, Wisconsin. 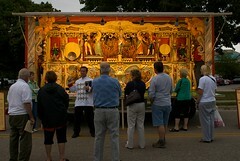 (Seriously, what is with Wisconsin and circuses?!) Within a few years, the Ringling Brothers Circus established itself as one of the best-run circuses on the circuit. Eventually, Ringling Brothers grew larger than Barnum & Bailey, and the Ringling Brothers acquired the other circus in 1907. The shows ran separately until 1919, when they merged to become Ringling Brothers Barnum & Bailey Circus, also known as The Greatest Show on Earth. If you note the dates, the Ringling Brothers and Barnum & Baily circuses were both running strong by 1910, when “Thunder and Blazes” was published in the United States. While it is undocumented which circus or circuses picked up the song, it is interesting to note that the song’s publication happened just as circuses were becoming a part of the American pop culture history, which probably explains why the song is so strongly associated with circuses. WWF wrestling character Doink the Clown, originally played by Matt Osbourne starting in 1992, uses a fairly standard version of Entrance of the Gladiators as his theme. The theme appears in the film Mary Poppins (1964) as part of the song “Jolly Holiday”. (That’s the one with the dancing penguins.) In the video clip below, the theme shows up at 2:04, as played by Richard Sherman on kazoo. The theme is all over a 1967 episode of The Monkees called “Monkees at the Circus”. You can watch the whole episode below, but you’ll notice that the theme appears even before you get to see Monkees. Where else have you heard Entrance of the Gladiators? That was fascinating, and authoritative! I’d never even registered it in Yakkety Sax, and have probably heard it dozens of times. Yeah, that’s definitely in the circus screamer mode. Thanks for the link! I need to go watch Gremlins 2 now. Oh, this reminded me of another piece of music that seemed ubiquitous to circus scenes (particularly high-wire acts) in my childhood, which I only later discovered was a piece of classical music by a composer from Mexico. I’m referring to Sobre las Olas or Over the Waves by Juventino Rosas. As you can see from the items in the “in popular culture” list in that wiki article, I think this would make an excellent eventual follow-up to this article. WOW! I never knew what that one was. Thanks for the link! I definitely think a follow-up article is warranted.